Campo Alegre, an exceptional travel in Argentina, in an accommodation with some comforts! Welcome to Campo Alegre ! A quiet place carefully designed for relaxation and comfort. Situated at only 11 km. from the center of Villa Carlos Paz, a town in the geographical heart of Argentina in the beautiful province of Cordoba. Host of the annual International Rally of Argentina and the new edition of Dakar. Come and spend your holiday at our luxurious Posada, where you can exchange your busy city life for the peace and charm of the 'campo' with its enchanting nature. 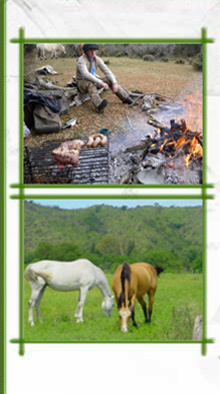 You can explore the region on our horses or go out on a boar on nearby Lake San Roque.